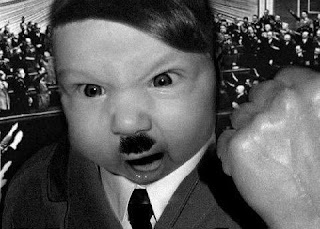 Weird WWII: Real Weird WWII: Heil Daddy?! Real Weird WWII: Heil Daddy?! Well it looks like Uncle Adolf knocked himself up a young French girl while on leave in France during WWI and had himself a boy. Read Peter Allen's article below and see what you think. Talk about having some father issues, YIKES! "Jean-Marie Loret, who died in 1985 aged 67, never met his father, but went on to fight Nazi forces during the Second World War. His extraordinary story has now been backed up by a range of compelling evidence, both in France and in Germany, which is published in the latest edition of Paris's Le Point magazine. Hitler is said to have had an affair with Mr Loret's mother, Charlotte Lobjoie, 16, as he took a break from the trenches in June 1917. Although he was fighting the French near Seboncourt, in the northern Picardy region, Hitler made his way to Fournes-in-Weppe, a small town west of Lille, for regular leave. There he met Miss Lobjoie, who later told their son: "One day I was cutting hay with other women, when we saw a German soldier on the other side of the street. "He had a sketch pad and seemed to be drawing. All the women found this interesting, and were curious to know what he was drawing. "I was designated to approach him." The pair started a brief relationship, which resulted in the birth of Jean-Marie, who was born in March 1918 after being conceived during a 'tipsy' evening in June 1917. Miss Lobjoie later told Jean-Marie: "When your father was around, which was very rarely, he liked to take me for walks in the countryside. "But these walks usually ended badly. In fact, your father, inspired by nature, launched into speeches which I did not really understand. "He did not speak French, but solely ranted in German, talking to an imaginary audience. Even if I spoke German I would not be able to follow him, as the histories of Prussia, Austria and Bavaria where not familiar to me at all, far from it. "My reaction used to anger your father so much that I did not show any reaction." Jean-Marie was, like thousands of other French children with German soldier fathers, badly treated by his peers at school. He was referred to as 'the son of the Boche', and often had fights as he tried to defend his father, who had by now disappeared over the border back to Germany. Miss Lobjoie, meanwhile, refused to discuss Jean-Marie's father, and ended up giving her only son away for adoption in the 1930s to a family called Loret. His real father would not recognise Jean-Marie, but continued to stay in contact with Miss Lobjoie. Incredibly, Mr Loret went on to fight the Germans in 1939, defending the Maginot Line before it was bypassed during the Nazi invasion which resulted in France being occupied from 1940 until 1944. Mr Loret even joined the French Resistance, and was given the codename 'Clement'. Just before her death in the early 1950s, Miss Lobjoie finally told Jean-Marie that his father was arguably the most infamous dictator in human history. Mr Loret said: "In order not to get depressed, I worked non-stop, never took a holiday, and had no hobbies. For twenty years I didn't even go to the cinema." 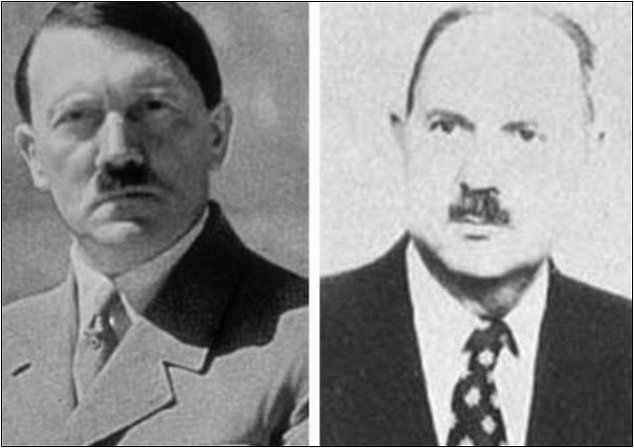 Mr Loret began investigating his past in great detail, employing scientists to prove that he has the same blood type as Hitler, and that they even have similar handwriting. Photographs of the two also reveal an astonishing resemblance. Other elements which corroborate the story are official Wehrmacht, or German Army, papers which show that officers brought envelopes of cash to Miss Lobjoie during the Second World War. When Miss Lobjoie died, Mr Loret also found paintings in her attic which were signed by Hitler, who was an accomplished artist. In Germany, meanwhile, a picture of a woman painted by Hitler looked exactly like Miss Lobjoie. Francois Gibault, Mr Loret's Paris lawyer, said: "He first came to see me in 1979, but was a bit lost and did not know whether he wanted to be publicly recognised as Hitler's son, or to erase all that completely. "He had the feelings of many illegitimate children: the desire to find a past, however heavy, but also the fear of returning to the old routine. "I talked with him a lot, playing the role of psychologist rather than lawyer." Mr Gibault said that Mr Loret's own children might now be in a position to claim royalties from Mein Kampf ('My Struggle'), Hitler's famous book which has sold millions of copies around the world. Mr Loret wrote a book called 'Your Father's Name Was Hitler' in 1981, and it is now set to be re-published with all the new evidence. Hitler, who was born in an Austrian village, frequently spoke of his love for France, and especially for Paris. In December 1940, he paid an emotional visit to the capital city, where he was pictured saluting Napoleon's tomb in front of his bemused generals. More intriguingly still, Hitler transferred from Vienna part of the remains of Napoleon II, Napoleon Bonaparte's son with Marie Louise of Austria. Hitler often enthused about the greatness of Napoleon, saying that he wanted to have as big an impact on history as the Frenchman. Although he never officially had any sons or daughters of his own, Hitler often spoke of his love of children and animals. He married his mistress, Eva Braun, as the Red Army shelled his bunker in Berlin, in 1945, and committed suicide shortly afterwards."